This campus map shows the location of the library on campus. Look for the VP symbol to find the nearest parking. Feel free to come in any time the library is open. Here are the library's hours. We hope you enjoy our beautiful building as much as we, the Loras Community, appreciate its offerings. Please feel free to contact any library staff member if you need assistance. 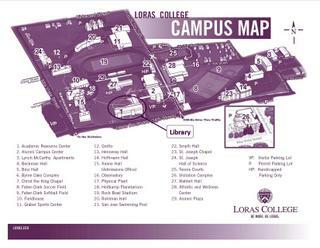 To find the location of the library on the Loras College Campus, please consult our campus map above. There are many other points of interest on our campus, as well. An excellent library is an integral part of any strong academic program. The Loras College Library, with a staff of nine and a collection of approximately 355,000 items and access to approximately 11,000 journal titles, fulfills this mission. The Library's Special Collections room allows our students access to unique, primary source materials. A large collection of DVDs, videos, and audio books complement the collection. Search the library's online catalog for information about specific titles. Keep in mind the library's collection has been chosen to support the curriculum of Loras College and the needs of its students. We encourage the community to use the library as a gathering place. However, quiet study areas are provided for faculty, staff, and students. The library serves as an official document depository for the United States government and the State of Iowa. Feel free to consult the library's guide to government information. In addition to the regular collection, the library shows its rich heritage in its special collection of rare books, as well as, the photographs and manuscripts in the Center for Dubuque History located on the 1st floor of the Academic Resource Center. The artwork in the library contains a large variety of works by nationally known and local artists. Here is a list of the art and its location in the building.